Among the Garos in Bangladesh, six language varieties are spoken: A'tong, Abeng, Brak, Chibok, Dual, and Megam. Together these are all called the Mandi language. 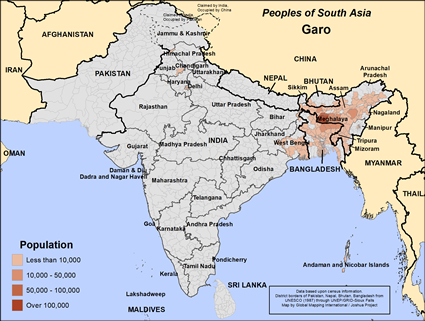 Within Bangladesh mostly the Garos are living in the northern area of Dhaka and Sylhet divisions along the Indian border. Some Garos are living in Modhupur area of Tangail district and some are living in Mallikbari, Bhaluka of Mymensingh district and in Kewachala, Shripur of Gajipur district. Most of the Garos are poor. Their main occupation is farming, and many of them farm as day laborers. Known for their integrity and hard-working spirit, Garos are also commonly employed by NGOs. Some also work in government offices, medical centers, and schools. About 80% of them are at least somewhat literate, and the number of Garos attaining higher education is increasing day by day. 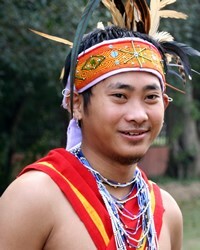 Many Garos are living in very simple houses made of bamboo, straw, and mud. Some of them have brick-wall and tin-roof houses. Most Garo villages are neat and clean. Almost all the Garos are Christian. They have the complete Bible in the Achik language written in Roman script published by the Bible Society of India. The Bangladesh Bible Society also published a New Testament in Bangla script using the Abeng dialect, which is spoken as a language of wider communication among Garos in Bangladesh. View Garo in all countries. Location in Country: Mymensingh plains.